Add the Comfrey leaves to the olive oil in a pan and simmer, stirring constantly, for about 30 minutes. Pour the mixture into a cotton bag or square and gather up, then squeeze this mixture (wearing gloves because it is hot) into another pan. Add the beeswax to this strained oil mixture and stir well over a low heat until it melts. Pour to a jar and place the lid on the jar without doing it up. 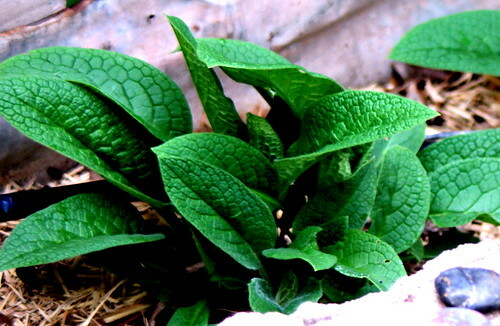 When the Comfrey ointment mixture has cooled, tighten the lid and store in the refrigerator for up to 3 months. I have made this and I have used baking paper in the pan to protect the shallow frying pan and once strained into the muslin over another piece of baking paper I then used that baking paper as a funnel to pour the mixture into the clean glass jar to cool and store. My partner had a niggling injury to his elbow and when I used a Comfrey poultice on this, The raw comfrey inflamed his arm and it took some days for that inflammation to go. However, once using Comfrey balm that did help the Tennis Elbow and he had some relief from the pain. So be a little careful applying straight comfrey leaves to the skin if you are sensitive. His injury is not tennis related. It is an over stretching of the ligaments in his arm from picking up wood in the fashion he got into the habit of. A habit to break. So I had to made the balm / ointment to use instead of the straight Comfrey leaves to avoid causing the same inflammation. I made this following recipe. You get the Beeswax from any honey person or health food shop. 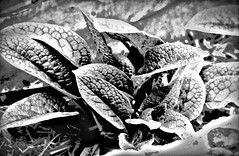 Grow the Comfrey because its the staple herb for the garden, chooks love it, compost loves it and of course it has these healing properties for Bone, Joint and Ligament injuries. Use no more than ten (10) days in a row and for no longer than 4 to 6 weeks in any 12 month period. It is a strong mixture and should have done the job in that time.